This article is about the hero, Back Alley Brawler. For the developer, Christopher Bruce, see Back Alley Brawler (Developer). Back Alley Brawler is a member of the Surviving Eight and the Regulators. He served as a hero trainer in Galaxy City in the Freedom Court section located 315 yards south of the Paragon City Monorail station at coordinates (367.0, 66.0, -832.0) until Issue 21 when Galaxy City was destroyed. Following this, he relocated to Atlas Park inside the police station at coordinates (-1365.8, -101.0, -2044.7). His location is marked on the map as a contact. on the Agree to Mender Silos' mission mission during the Mender Silos Task Force as a Pet and an Ally (Levels 46-50). The Brawler was the son of a gang enforcer. He joined the Paragon City police force to try and make a difference. When he realized that was not getting the job done he adopted the name and costume of a hero. He fought in the streets and alleys, of the city, all through the late 70's and the 80's. He briefly went into retirement after that, but came back out to help with the Rikti war. One of the most veteran heroes in Paragon City, the Brawler is in semi-retirement, training the next generation of heroes. Though he rarely goes into the field these days, his power and fighting skills are still as potent as ever. Michael White was the son of a gang enforcer. He joined the Paragon City police force to try and make a difference. When he realized that was not getting the job done he adopted the name and costume of a hero, the Back Alley Brawler. Michael used training techniques from all over the world to toughen his resistance and increase his strength. All through the late 70's and the 80's, he fought in the streets and alleys of the city. The Brawler briefly went into retirement after that, but came back out to help with the Rikti War. Now he coordinates the efforts of heroes in Galaxy City. After the attack on Galaxy City in September 2011, where he worked with Sister Psyche to fend off the Shivan menace, he can now be found stationed in the PPD office in the north-east of Atlas Park. You look like you need some help. You have helped defeat Back Alley Brawler in Recluse's Victory. Back Alley Brawler's Praetorian Earth counterpart is Marauder. He is mentioned in the description of the Brawler exploration badge, and he is the subject of many plaques spread throughout the city, leading to earning the Scholar history badge. He was a member of the Regulators along with Blue Steel. His name is sometimes given as "Back Street Brawler" in various forums, but Back Alley Brawler is the correct name. Back Alley Brawler is the representative of "Melee Damage" playstyle when creating a new character with the new interface in Issue 21. A wallpaper exists of Back Alley Brawler in his earlier years teaming up with Statesman. 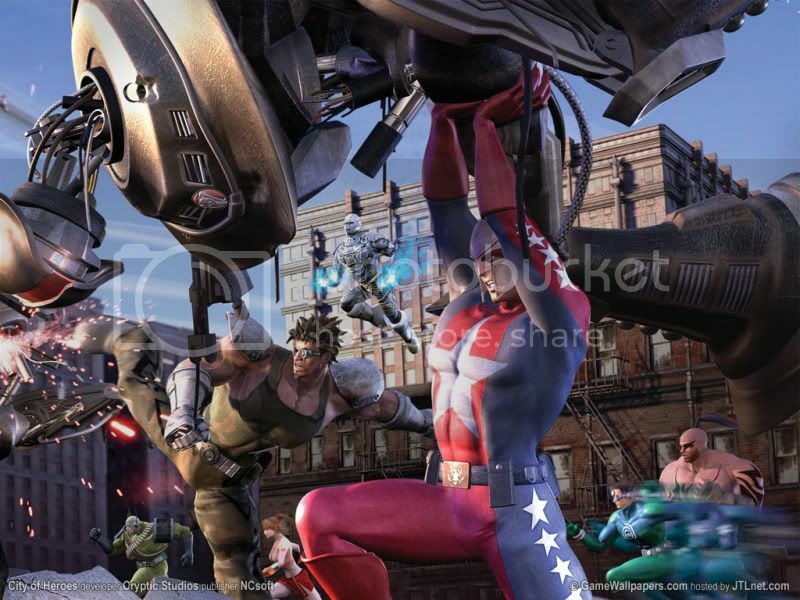 The same design is used in the Blue King Studios comics of City of Heroes when Back Alley Brawler teams up with War Witch, Horus, and Apex in issue 12 of the series. This page was last modified on 17 September 2011, at 02:19.